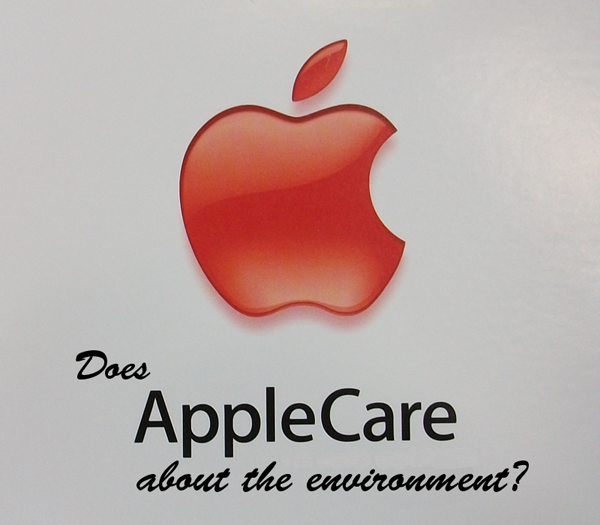 Does AppleCare about the Environment? 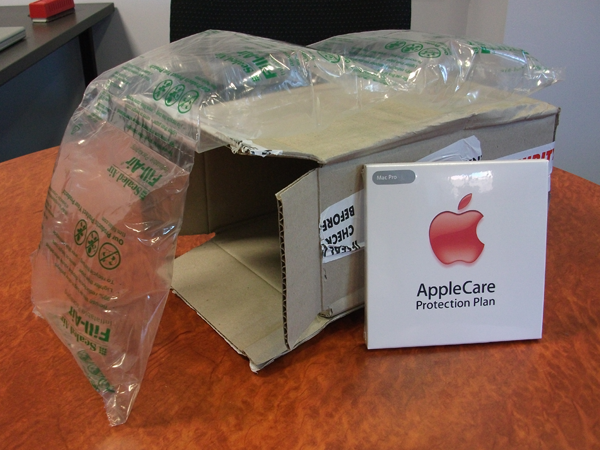 Received a parcel today from Apple, eagerly opened it since I'm expecting a new Apple mouse. 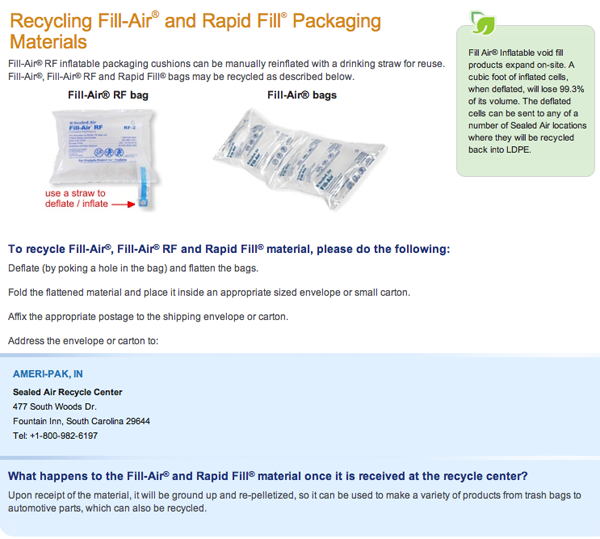 On first glance it seemed to be full of air, air carefully packaged in plastic by the good people at Fill-Air, or perhaps that is now Sealed-Air. But it turns out there was a small box at the bottom with my AppleCare documents. Given the packaging I assumed perhaps there was also a DVD, but no, just some paper. Some very well protected paper! On closer inspection the AppleCare Protection Plan has approximately 90 pages, only 30 in my language, 5 pages on "country variations" which obviously also don't apply to me, 3 pages of Apple Service Center information in other countries (complete with their opening hours!). In summary if Apple does feel paper is necessary then this could easily be printed on a couple of A4 sheets of paper and mailed to me, personally an emailed PDF would be even better. No wait, there's more! 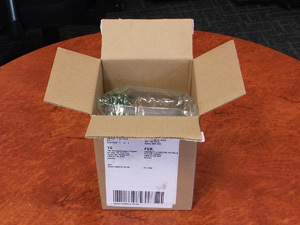 The packaging is supplied by "Sealed Air". Are they (and Apple by association) honestly suggesting that to recycle the plastic one should mail it to them! Because they don't seem to have a recycling service in Australia, I'm supposed to mail a small piece of plastic half way around the world for recycling. (I could have used another exclamation point there but they lose their effect if used too often). I quote from their website, which is also given below "Fold the flattened material and place it inside an appropriate sized envelope or small carton. Affix the appropriate postage to the shipping envelope or carton. Address the envelop or carton to" etc. Perfect, I have just such a small carton handy! Unfortunately that is going to cost me almost $15, more if I want to ensure it gets there by registered mail. As a small point I note they aren't too keen on this highly sustainable form of recycling since the link on the packaging directs one to "www.fillair.com/recycle", which resulted in a directory error: "The resource you are looking for might have been removed, had its name changed, or is temporarily unavailable." [I note that a week later the above link does now work, perhaps as a consequence of the media resulting from this page]. Good to know. If you are at sea and someone falls overboard don't bother rummaging through any AppleCare Protection Plan cargo on board to find some floatation. Not suitable as a baby's toy. Who are the cheapskate parents using packaging as a substitute for proper inflatable toys made from other toxic non-biodegradable plastic? The "safety" icons are hard to read on the packaging, at first I imagined this was "don't smother your baby" with our packaging. But on closer examination it is obviously, "not suitable as a baby's pillow". Comment relating to baby toy above applies. 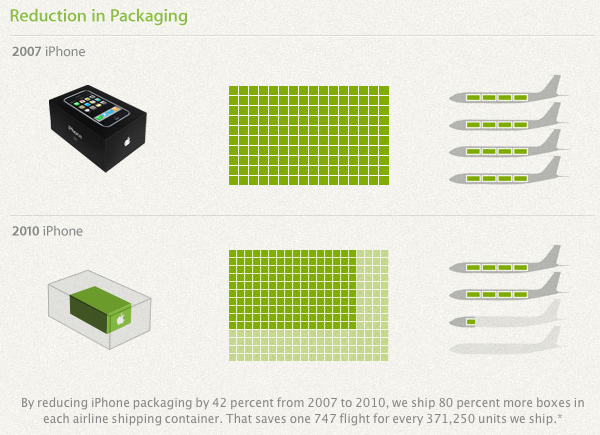 And finally (I promise, although I feel like I'm on a roll), from the Apple web site [http://www.apple.com/environment/, Sept 2011] I quote "Apple employs teams" (WOW) "of design and engineering experts who develop product packaging that's slim and light yet protective." Well in this case they win on (unnecessarily) "protective" but missed the mark on "slim and light". The following, rather lame, diagram appears just below the above quote. 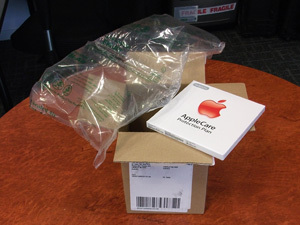 Unfortunately, while the AppleCare document could be transported in a thin envelope it is actually transported in a box that could hold at least 4, if not more, iPhones. I scoff at the quoted 42% saving, here's a chance for a 99% (or more) saving. Come on Apple, we love you but this is verging on a joke. Did I really think I could change the world? 6 months later and I receive my next Apple computer. Sure enough, the same box fill of air, a DVD, and a few uninformative pages in a manual. Hang on, this box is BIGGER, and there is now an extra bag of air packaging.